*When the new One World Trade Center rises in a few years as NEW YORK's tallest building, it won't have the city's TV stations broadcasting from its spire 1,776 feet above ground level. The Metropolitan Television Alliance (MTVA), the group formed by the stations after the 9/11 attacks destroyed their old sites atop the original 1WTC, is pulling out of a deal to build a new master-antenna site at the top of the new building. MTVA president Saul Shapiro says technology and circumstances have changed since 2001, making the new site (and its reported $10 million annual rent) unnecessary. Some history here: when the original WTC towers began to rise in the early 1970s, New York's TV stations had all settled in at what was then the tallest building in town, the Empire State Building. Originally the exclusive domain of NBC, Empire began opening its doors to other broadcasters in the early fifties, and within a few years it was home to pretty much all the TV stations in the city. But construction of the taller Trade Center buildings caused multipath and ghosting issues for viewers in lower Manhattan and Brooklyn, essentially forcing most stations to move to the new 1WTC mast. Several FM stations (WKCR 89.9, WPAT-FM 93.1, WNYC-FM 93.9 and - for a time - WPIX 101.9) eventually joined the TV stations downtown at the Trade Center, drawn there mainly by lower rents than at Empire. As we chronicled back in 2002, the destruction of the Trade Center site sent those broadcasters rushing back uptown to Empire, where much had changed in the quarter-century since the TV stations had moved out. The space those old analog TV antennas had occupied on the Empire mast was by then filled with a new master FM antenna and antennas for several newer UHF TV stations that had moved in when the bigger stations moved out. At the time, the idea of returning the rest of the TV stations to Empire was seen as temporary. With promises being floated of a quick start to construction of a new skyscraper at the old Trade Center site, all the same multipath issues that plagued the Empire TVs in the seventies were bound to resurface, and with easy credit in plentiful supply, the cost of building a new master TV antenna setup downtown (or even a massive new TV-specific tower in New Jersey) seemed to be no obstacle. Then everything changed. As the so-called "Freedom Tower" kept getting delayed and delayed again, the TV stations began to settle into more permanent homes at Empire or at another new site a few blocks uptown, the Durst Organization's Four Times Square. The economic slowdown turned the cost of a Trade Center master site into a major obstacle. 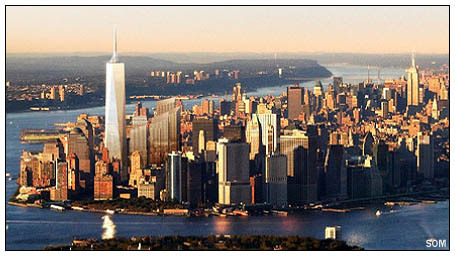 And perhaps most significantly, broadcasters realized that in the DTV era, they no longer need the additional 300 feet of height that the 1WTC tower will give them, since DTV receivers have no issue with the kind of fixed multipath reflections that caused intolerable ghosting on analog signals after the original 1WTC was built. So what happens now? There's still more work to be done at Empire, where the end of analog TV in June will free up some antenna space (particularly at the very top of the mast, now home to analog channels 4 and 5, and near the bottom, home to analog channel 2), setting in motion another reconfiguration of that constantly-changing site. Four Times Square continues to sign new clients for primary and backup use. Downtown at 1 WTC, developers say they'll still put up the spire that would have supported the new TV antennas, but at least for now it will be purely decorative. *While we're eighty-plus floors above ground at Empire, the changing of the locks on the transmitter-room door at WBAI (99.5) is once again provoking the sort of controversy that seems to swirl around the Pacifica station every few years. The tension, as usual, comes between WBAI's New York programmers and Pacifica's California-based national management, and this time it appears to be largely financial. The national office says WBAI is $800,000 behind on money it's owed, as well as being several months behind on its transmitter and studio rent. The national office also says WBAI's fundraising has been declining, leading to a monthly deficit of at least $30,000 - which is why the order apparently came down from Pacifica's national office to change the locks in order to maintain control, if need be, of WBAI's broadcast signal. At the local level, the usual accusations of racism, race-baiting and anti-Semitism that seem to be a constant thread in WBAI's internal disputes have once again surfaced, and the usual factions are once again battling it out on the airwaves and all over the internet. Meanwhile over at "Now," there's a new APD/MD in the house - he's Rob Wagman, formerly PD at Clear Channel's WIBT in Charlotte. *On the TV side of things, we were remiss last week in not mentioning the impending departure of Len Berman from WNBC (Channel 4), where he's been sports director for more than two decades. As NBC continues to reconfigure its local station operations to pare costs and eliminate high-priced talent, the sports department was an obvious place to cut, and so Berman will be gone later this month or early in May. Berman says he plans to stay in TV sports - somewhere. Standards are out and talk is in at Pamal's AMs up and down the Hudson Valley, as WGHQ (920 Kingston), WBNR (1260 Beacon) and WLNA (1420 Peekskill) flip to the "Hudson Valley Talk Radio Network." The local "Good Morning Hudson Valley" show that had been heard on all three stations continues in morning drive, followed by Laura Schlessinger, Dave Ramsey, and Fox Sports Radio from 5 PM until 6 AM. So who won? Bard College is the tentative selectee for a new noncommercial signal on 88.1 in Annandale-on-Hudson; its application beat out one in Woodstock and three more across the state line in Great Barrington and Housatonic, Mass. Farther upstate, six applicants were contending for signals in and around Albany, and a religious group called Pax et Bonum won the tentative preference for 89.9 in Esperance, in the hills southwest of the state capital. *Up north, WCLX (102.9 Westport) has ended its simulcast on WELX (107.1 Dannemora); the 107.1 signal has changed its calls to WNMR, and we're not sure what it's programming now. Nor do we have many details to offer - yet - on the programming being heard on WIPS (1250 Ticonderoga), which came back on the air last month, just in time to avoid having its license deleted for being silent an entire year. Also up that way, WLPW (105.5 Lake Placid) has again been granted a construction permit to boost power from class A to C3, running 25 kW/-174' from its current site on Averyville Road near the village; at least two previous iterations of the same CP have expired unbuilt. And Randy Michaels has calls on his as-yet-unbuilt 100.7 in the remote Adirondacks town of Minerva - it's WXMR, at least on paper. In Albany, Sherman Baldwin and co-host John Garb are out after just over six months as afternoon talk hosts at WROW (590), where budget cuts are replacing their local show with syndicated talk. 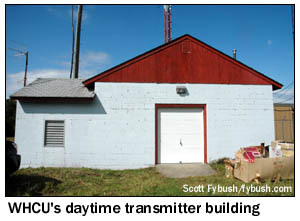 We're grateful to CNYRadio.com for keeping us updated on the transmitter fire that briefly silenced WHCU (870 Ithaca) on Tuesday morning. 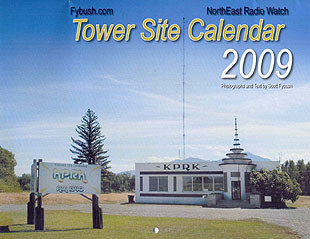 The fire broke out at WHCU's daytime transmitter site east of Ithaca, which is shared with sister station WYXL (97.3), and while the station is extremely fortunate to have two separate transmitter sites for day and night operation, it was unable to switch over to the night site (on Protts Hill, south of Ithaca) immediately, because the studio-transmitter link to the night site hops through the day site first. It took a couple of hours to find an alternate audio path to the night site, allowing the station to get back on the air with at least its directional 1000-watt night signal - and later in the afternoon, engineers were able to get the 5 kW nondirectional daytime rig back on the air. *One of the last jocks to be heard on WWDJ (970 Hackensack, NEW JERSEY) before the station's flip from top 40 to religion 35 years ago this month has died. Howard Clark's career took him to KFRC and KYA in San Francisco, WKY in Oklahoma City, WTIX in New Orleans and eventually to Shreveport, Louisiana, where he settled down and continued working in local radio until retiring in 2006. Clark died last Monday (April 6) at age 70. We also note the death of John "Roman" Domanski, whose career took him to Florida, Michigan - and WKXW (101.5 Trenton), where he was PD in the early eighties, when the station was still "Kix 101 1/2." Domanski died March 8 in Florida, at age 55. Fitchburg's WEIM (1280) has a new set of calls and a new identity. The station scrapped the only callsign it's ever had last Tuesday, becoming "The Heart of New England's Pulse," with a new format of "talk, sports and information," new calls of WPKZ - and maybe a new FM relay on the way as well. Owner Central Broadcasting Company has just applied to buy translator W243CD (96.5 Gloucester) from Radio Assist Ministry for $45,000 after an earlier sale of the license failed to close over the winer, and there's a newly-filed application to move the translator down the dial to 95.9. Will the next step be a series of hops to move that translator west into the Fitchburg market? A bit of irony: when WVEI was preparing for its debut a year or so ago, one of the locations Entercom considered for a local studio was the Basketball Hall, but we hear high rents sent the FM station elsewhere. Meanwhile at Entercom Boston, budget cuts have claimed the job of WAAF (107.3 Westborough)/WKAF (97.7 Brockton) night jock Bob Hannah; at least for now, his shift is being automated. Out of a group of 13 mutually-exclusive noncomm applicants stretching from southern New Hampshire down through southeastern Massachusetts, the FCC winnowed the list down to two that proposed service to Amesbury - one from UMass Boston, for 88.5, and one from the Centro Familiar de Adoracion church in Chelsea, for 88.7. But the Commission flagged the CFA application for a serious error: it overlooked four other noncommercial stations in the region when it calculated the number of listeners who'd get first or second new noncomm service. That gave the edge to the WUMB folks, who get the tentative selection. *In RHODE ISLAND, we jumped the gun a bit on our report last week of a format change at Citadel's WPRV (790 Providence). The flip from oldies to talk/business in fact happens today, and here's how it plays out: Don Imus remains in place in morning drive, followed by Citadel's Joe Scarborough at 10 AM, Bloomberg business news at noon, Dave Ramsey at 2 PM, more Bloomberg at 5, then a local show, "The Making Money Show" at 5:30. When evenings aren't occupied by Yankees baseball, "AM 790" will be carrying Lou Dobbs' talk show at 7 PM, followed at 10 by Citadel's Curtis Sliwa. Over at WJAR (Channel 10), there's still no replacement for news director (and 22-year station veteran) Betty-Jo Cugini, one of a dozen staffers to lose their jobs in the most recent round of cuts at the Media General-owned NBC affiliate. The cuts also included chief meteorologist Gary Ley and weekend anchor Kelley McGee. *CONNECTICUT's attorney general is stepping in to examine Tribune's plan to merge the news operations of its Hartford Courant and its two TV stations, WTIC-TV (Channel 61) and WTXX (Channel 20). The company says its plans to move the TV stations in with the Courant are both completely legal and unavoidable, given present economic conditions - but Blumenthal says the announcement raises "concerns about public access to diverse and competing sources of information," as well as the specter of job losses. One job has already been lost, since Tribune wasted no time replacing Courant publisher Stephen Carver with WTIC/WTXX general manager Richard Graziano, who will now oversee both the newspaper and the TV stations. And given recent statements from the FCC, which looks to be ready to toss newspaper-TV cross-ownership restrictions out the door completely in a bid to prop up the sagging newspaper industry, it looks as though the Courant-WTIC-WTXX merger may be more a sign of things to come than anything else. *A silent NEW HAMPSHIRE FM station can stay that way for a few more months. The FCC granted Bruce Danziger's Capitol Broadcasting a six-month extension of the special temporary authority allowing WWHK (102.3 Concord) to remain off the air. The station is in the process of being sold to Andrew Sumereau's Birch Broadcasting, and has to be back on the air by September 4 (at least temporarily) or it will lose its license. *J.J. Jeffrey's Atlantic Coast Broadcasting has shuffled its programming lineup again in southern MAINE, pulling the WEEI feed off the 95.5 signal in Topsham most recently known as WGEI. 95.5 is now WLOB-FM, simulcasting the talk format of WLOB (1310 Portland) - which means it's essentially swapped formats with the former WLOB-FM on 96.3 in Gray, which is now sports WJJB-FM, the same call and format that used to be on the smaller Topsham signal. Atlantic Coast is still carrying WEEI, via the Saco-licensed 95.9 signal (ex-WRED-FM) that's now WTEI. We've been remiss in not mentioning the layoffs that hit family-owned WABI-TV (Channel 5) in Bangor earlier this month. In all, seven jobs were cut at the CBS affiliate, most notably veteran anchor Craig Colson, who came to WABI at age 18 in 1985 to work alongside his father, anchor Don Colson. Also cut was coastal bureau reporter Susan Farley, but WABI says her bureau in Ellsworth will remain in place without any full-time staffing. *In PENNSYLVANIA, the talent shuffle at Philadelphia's WXTU (92.5) continues, with Kris Stevens moving from afternoons to mornings, replacing Scott Evans alongside Andie Summers. "Razz on the Radio" moves from nights to afternoons, leaving an opening in the night slot at the Beasley country station. A year after acquiring WDBA (107.3 Du Bois), Family Life Radio has finally changed the station's calls: it's now WCOH. From the noncommercial FM files, the FCC has picked Cumberland Valley Christian Radio's application for 600 watts on 91.3 in Carlisle over five other applicants proposing service to either Carlisle or Newville. And in State College, it's a new AM-FM simulcast in morning drive: Kevin Nelson and Pat Boland's morning show on news-talker WRSC (1390) is now being simulcast on sister FM outlet "Majic 99" (WMAJ-FM Centre Hall). *In CANADA, the Canadian Press reported last week that federal officials are contemplating a C$150 million bailout package that would help private broadcasters keep small-market local TV stations afloat. On Wednesday, prime minister Stephen Harper said no decision had been made about the proposal, which could keep stations such as Canwest's CHCH in Hamilton and CTV's A-Channel operations in Wingham and Windsor on the air. Finally this week, a programming note: we're on the road, en route to the NAB Show in Las Vegas via Phoenix and Tucson. If you're one of the broadcasters still making it to NAB this year, we'd love to catch up with you there...and if you're not, stay tuned to NERW next wek for an update from the show floor, such as it is. And on a personal level, thanks so much for the kind words from so many of you about the loss of Freckles, the NERW Wonder Dog. She's still very much missed here...but hearing from all of you was a great comfort to us here at NERW Central. NEW YORK's WNYC and Public Radio International are just a week away from launching their new morning show, "The Takeaway." Hosted by John Hockenberry and Adaora Udoji, the new show will be heard on both of WNYC's radio services - from 6-7 AM weekdays on WNYC-FM (93.9) and from 8-9 AM weekdays on WNYC (820), pre-empting portions of the current "Morning Edition" simulcast on the stations. A venerable New York radio brand has resurfaced on the FM HD2 dial. CBS Radio quietly shifted the HD2 signal of WWFS (Fresh 102.7) from a simulcast of all-news WINS (1010) to "WNEW, Where Rock Lives." The main 102.7 signal was, of course, home to WNEW-FM for more than four decades; its new HD2 incarnation features a more current blend of active rock than the last few analog incarnations of WNEW did. In Albany, a long-dormant AM signal is back on the air with a new city of license and coverage area. WUAM (900 Saratoga Springs) lost its transmitter site years ago, and spent a long time operating at reduced power or off the air completely. Now the station has been moved to Watervliet, diplexing with WAMC (1400) from its tower just off I-90, giving it a decent daytime signal over Albany for the first time. Owner Ernie Anastos is leasing the signal to Time Warner's Capital News 9, which is using it to simulcast the news channel's audio for in-car listening. There's another AM-to-FM switch in the works in CANADA: CTVglobemedia is applying to move CKKW (1090 Kitchener) over to the FM dial, trading the station's big 10 kW AM signal (from a nine-tower site that's expensive to maintain) over to a much more limited 2 kW signal on FM at 99.5. Alert NERW readers may recall that 99.5 was used in Kitchener a few years ago, by startup station CIKZ, but incoming interference from superpower co-channel station WDCX (99.5 Buffalo) eventually forced CIKZ to shift up the dial to 106.7. Will CKKW be able to overcome the interference any more effectively? CHUM Television is going national. Just after NERW initially went to press Monday morning, the company announced that it's buying Craig Television, giving it the "A-Channel" stations in Edmonton, Calgary and Winnipeg and CKX-TV in Brandon, Manitoba, as well as MTV Canada. Craig went into competition with CHUM in Toronto with last year's launch of "Toronto 1" (CKXT), which will have to be spun off because CHUM already owns flagship CITY-TV and Barrie's CKVR in the Toronto market. Much more next week! WMTW's seven-person radio news staff is out as a result of the changes, which a Nassau memo to advertisers says will end up with new - and separate - formats on each of the three former news-talk facilities. (From Nassau's memo: "One format is an 'old favorite.' One format will provide a nice counterbalance to a big name already in the market. One format will 'shock and awe.'" There's a new LPFM on the air in NEW HAMPSHIRE: WLLO-LP (102.9 Londonderry) began testing late last week from Londonderry High School, playing a variety of songs about radio. "Leo 103" was scheduled for an official launch Saturday (April 10). Concord's WKXL (1450) is getting new owners, as Warren Bailey's Embro group sells to a partnership of former Republican senator Gordon Humphrey and George Stevens. The pair will pay a reported $830,000 for the station, and they'll keep Bailey on to run things for them, promising to add more local news coverage - and to keep talk host Deborah "Arnie" Arnesen, whose politics are about as far from Humphrey's as it's possible to get. NEW YORK lost one of its best-loved morning men last week, with the death on Thursday (April 8) of Gene Klavan, who woke up New Yorkers on WNEW (1130) from 1952 until 1977, most of that time with partner Dee Finch. Klavan came to WNEW as the replacement for Gene Rayburn, who left to launch the TV career for which he's best remembered. Klavan's partnership with Finch lasted until 1968, and he remained at 1130 solo for another nine years before leaving for WOR, where he put in three more years before retiring in 1980. Klavan had been suffering from cancer; he was 79. We'll start again this week in MASSACHUSETTS, where a week of suspense for listeners of WBOS (92.9 Brookline) ended Thursday afternoon without much change in the station's AAA-ish AC format. You'll recall that the DJs were given a "week off" (not really -- they were still behind the board on Morrissey Boulevard, just not opening the mic) on April Fool's Day; the only big change in their absence was the addition of some more mainstream classic rock, apparently in an attempt to fill the gap just up the dial created by the end of the Eagle at 93.7. Speaking of WEGQ (which has yet to be formally granted the rumored WQSX calls), we understand the airstaff there are also still on the job, again without opening the mic, as they apply for their jobs again at the new "Star 93.7." The rumor mill suggests that former Kiss disco guy Vinnie Perruzzo could end up doing afternoons on Star; we'll keep you posted. Obituaries: Tom Shovan, the VP of New York's CD Media, died Friday morning (April 9) after suffering a fall at home earlier in the week. Shovan began his radio career up in New Hampshire, at Concord's WKXL, in 1954. In 1958, he came to Boston as one of the several "Melvin X. Melvin"s on WMEX (1510). Shovan was 59.